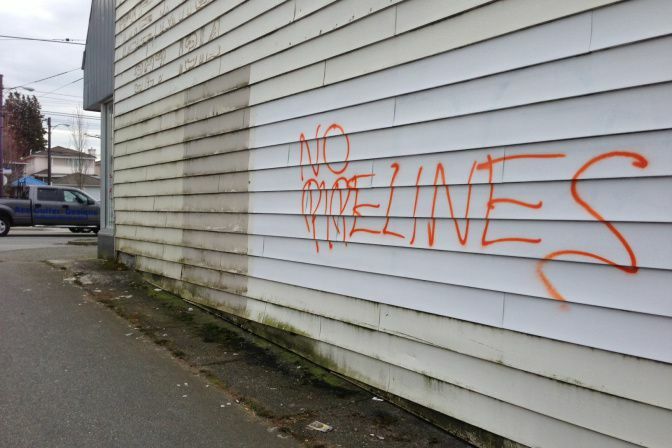 No Pipelines graffiti on Commercial Drive, Vancouver BC. At around 9AM on June 3, 2014, approximately 16 cops from the Vancouver Police Department raided a house in East Vancouver under the pretext of investigating six mischief charges related to graffiti tags dating from June, July, and October of 2013. The four residents of the house, and one guest, were removed one by one from the house by police aiming pistols at them. One person inside the house looked out their bedroom window and saw a cop pointing his pistol at him. The house targeted by the raid is comprised of radicals involved in Indigenous resistance as well as anarchist projects in the city (including the editor of the Warrior Publications wordpress site). Once removed from the house, the five people were placed in a prisoner transport van while a K9 team entered the house to search for any remaining people. After the K9 team searched the house, a forensic identification unit with a video camera appeared. They first filmed the exterior of the house and the yard, then entered the house itself. After filming the interior, they then used a camera to take photographs. At around 11AM, all but one of the five persons taken from the house were released. The last person held was told he would be charged with 6 counts of mischief under $5000 and taken away in the prisoner transport van. Those released were told to leave the area and that police would contact them once the search was over. The primary warrant used for the raid was dated June 2, 2014, and sworn by Detective Derek Wong of the Vancouver police based at 2120 Cambie Street. The time for the execution of the warrant is stated as being from 6AM to 9PM. The warrant is signed by EE Bowes. There is also a secondary warrant which is dated June 3, 2014, sworn by Ram Greoriou who is also identified as a Vancouver police officer. This warrant has a time of 3-5PM listed and is also signed by EE Bowes. Considering the minor nature of the charges, the raid carried out by the Vancouver police is clearly part of a larger strategy of politically motivated repression against radicals and especially the growing resistance against oil and gas pipelines throughout the province. As a tactic, the raid enables police to seize items such as computers, extract information from them, disrupt communications, and very possibly emplace spyware prior to their return. The raid and its subsequent occupation of the space by the cops provides them with the opportunity to take a snapshot of their target's lives, gather intelligence, and to possibly put in place listening devices. As a part of a strategy of repression, the raid is an attempt to intimidate and silence those involved in resistance movements. The raid would seem a gross misuse of public resources. A couple hundred bucks worth of paint and local labour could have taken care of the problem, if there even is one. Furthermore, an armed police raid is a highly disproportionate use of force and unwarranted (pardon the pun), considering the charges. Perhaps certain corporate sponsors of politicians in power are worried that the public campaign to stop the pipelines is more effective than anyone guessed. This is what state terrorism (and creeping fascism) looks like.